For Google the future is about beefing up the browser and its bottom line. This honest explanation of what motivates the search giant was given at Google IO, its developers conference being held in San Francisco. One of the "reasons we invest in moving the web forward is if it benefits Google economically," admitted Vic Gundotra, engineering vice president. But he also stressed: "The more money Google makes, the more it pours back into open source projects." 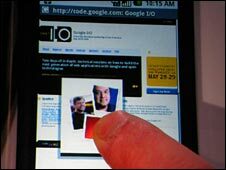 High on the agenda at IO was Android, Google's open source software platform being designed for smart phones. A demo at the conference revealed some new applications for its Android mobile operating system. 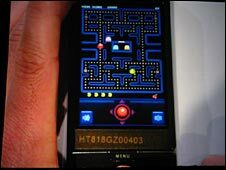 These include a way to unlock phones by drawing a specific shape on the touch screen, a compass tool that automatically orientates maps when a user looks at photographic images of a city, a magnifying tool to zoom in on web content and a mobile version of the video game Pac Man. The phone being used at the conference relied on fingertip touch but Andy Rubin, who is overseeing the project, said Android could also be tailored to work with a tracking ball. The first phones powered by Android are due out in the second half of this year. 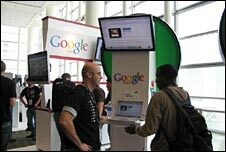 With about three billion mobile phones already on the market, some analysts believe Google could make about $5 billion annually within five years. 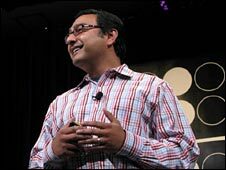 Google's engineering head Mr Gundotra played down any notion that Android is set to take on the iPhone even though it looks and acts a lot like Apple's phone. "I wouldn't say that at all. I think the iPhone is just a world-class device with a great web browser that delivers in many respects on one of Google's key goals; to bring the web to the mobile device." "I am a very avid user of Apple products. I buy everything they make. We wish every mobile phone was as good as the iPhone. Apple demonstrates there is plenty of opportunity to go around." Many of the developers at IO had come to hear about Google's App Engine, which was launched six weeks ago as one of a host of development platforms aimed at encouraging developers to put the browser ahead of the desktop. Ten thousand people signed up for beta testing while another 150,000 went onto a waiting list. The reason so many developers want to work with the engine is because it uses the same infrastructure that Google uses for many of its applications. During a conference presentation, Kevin Gibbs, the technical lead for the project, announced to cheers and applause that the engine would now be open to everyone and there was no waiting list. "You can log in immediately and start using it, so please create something and let us know what you think." Google also unveiled a rough draft pricing plan which will be finalised and become effective later in the year. Under the new structure, developers start with a free quota of 500MB and enough computer processing power and bandwidth for about five million page views per month. Mr Gibbs estimated that an application which received a total of 10 million page views would cost the developer about $40 (£20) a month. As a company known primarily for search, Google is trying to extend its reach and lure developers away from designing applications for the desktop and opt for the web instead. "We want to accelerate the capability of the browser," Mr Gundotra said during his keynote speech to developers. "The web is maturing at an amazing rate and it's getting better and better. I don't think there's any question that in terms of the question 'What has become the dominant platform? ', the web has won." Demonstrating the power of the web and the browser, Google said its Google Earth 3D visualisation software could now be embedded on web sites using a simple plug-in. 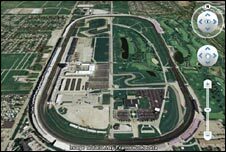 Google Earth technical lead Paul Rademacher said he expected it to be popular with property sites, where people can get 3D views of houses, and on travel sites where consumers can see the view from a hotel room. "Now inside a web page, you'll be able to fly through San Francisco or see a 3D model of a cabin with exactly the view out the window of the mountains."